The First Ever 13th Annual World’s Shortest St. Patrick’s Day Parade will welcome Kevin Bacon and his brother Michael as the celebrity grand marshals on March 17, 2016. In addition to the Bacon Brothers, actor Gary Busey will be the official starter of the parade. Hot Springs does “quirky” like no other city, and the short parade with a really long name is probably the piece de resistance in quirkiness. 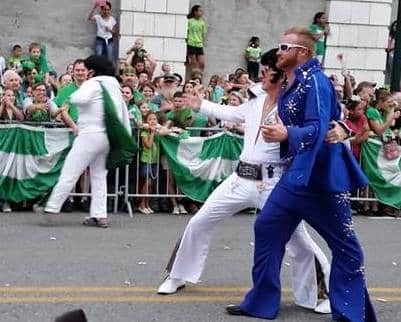 Held on Bridge Street in downtown Hot Springs, the parade is 98 feet of Marching Irish Elvi, Irish belly dancers, the World’s Largest Leprechaun, floats, marching bands, bagpipes, Dallas Cowboys Cheerleaders, and oh yes, a Blarney Stone Kissing Contest! If you want to kiss the Blarney Stone, be a the Hot Springs Convention Center at 4:30 pm. Parade Festivities begin a block away at 5:30 with special guests, and the official measuring of the parade route (just to make sure the street hasn’t grown) will be at 6:25pm. The Grand Marshals will lead the parade at 6:30, and a free after parade concert – featuring who else but The Bacon Brothers Band – will start at 7:30 pm. After all this zaniness, you’ll need a good night’s sleep followed by breakfast at Tiffany’s. St. Patrick’s Day is on Thursday this year, so you’ll want to be sure to reserve a three night weekend to explore everything Hot Springs has to offer. The tulips are ahead of schedule this year, so Garvan Gardens is a can’t miss! Of course, a stroll down historic Bathhouse Row is a must, as is a sunset cruise on DeGray Lake. Catch an evening show at Maxwell Blade’s Theater of Magic or the Five Star Dinner Theatre. Of course, you could always bring a good book (or borrow one of ours) and just relax and unwind on our front porch! Just let us know what you enjoy, and we’ll help you plan your weekend!